I've learned much recently about Sir Winston Churchill. He's a man I want to read and study about more the more I learn. In a time when there is so much else to do he is, in my opinion worth understanding. "Winston Churchill was born into a family with a history of mental illness." However there is a lot more to this story that is not all together clear from the research I've conducted online and in some books. "Although it isn’t clear whether it was the consequence of neurosyphilis or schizophrenia, his father had displayed psychotic symptoms in his life and Winston’s daughter Diana, who had a major depressive episode in 1952, would ultimately die by suicide in 1963. Churchill referred to his depression as his black dog.You can read the entire article here." What I love about this man is that he was such a fighter throughout a difficult time in history when he was one of the worlds greatest wartime leaders. He was born into the aristocratic family of the Dukes of Marlborough. One of the quotes I've found from which shares a bit of what may have been going on in the depths of this great man's mind was, " "I don't like standing near the edge of a platform when an express train is passing through. I like to stand right back and if possible get a pillar between me and the train. I don't like to stand by the side of a ship and look down into the water. A second's action would end everything. A few drops of desperation." - Winston Churchill (1874-1965) I'm not quite certain Churchill was as fragile as he is made out to be by some aspects of history but rather a man who struggled with depression and a family history of depression as many people do today. I'd say he was very strong indeed but I'm no expert on his history, just a beginner trying to understand what was going on in this man during this time in history. (From Wikipedia section on Physical and Mental Health). "Churchill himself seems, in a long life, to have written about Black Dog on one occasion only: the reference, a backward-looking one, occurs in a private handwritten letter to Clementine Churchill dated July 1911 which reports the successful treatment of a relative's depression by a doctor in Germany. 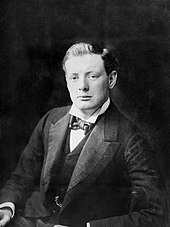 His ministerial circumstances at that date, the very limited treatments available for serious depression pre-1911, the fact of the relative's being "complete cured", and, not least, the evident deep interest Churchill took in the fact of the complete cure, can be shown to point to Churchill's pre-1911 Black Dog depression's having been a form of mild (i.e. non-psychotic) anxiety-depression, as that term is defined by Professor Edward Shorter." I have to admit that the more I learn the more skeptical I am about how much we can know about his mental health. His physician, Charles Wilson, 1st Baron Moran wrote a book titled, Churchill: The Struggle for Survival 1945-60. Also you may want to read a very interesting article by John H. Mather MD CIP FACPE here. The title is called, Lord Moran's book is based on his diaries. The Nobel Prize in Literature 1953 was awarded to Winston Churchill "for his mastery of historical and biographical description as well as for brilliant oratory in defending exalted human values". Since I'm an incurable researcher I've got to keep looking into this fascinating history of Churchill and his Black Dog. I do not think he would be frustrated or angry about revelations regarding his mental health as they have led to places such as The Black Dog Institute, of which I believe Churchill would be proud. I think his struggles made him more human and real to others. You are encouraged to visit The Churchill Centre. So in honor of mental health awareness and for those of us who are incurable researchers I'm giving away a $15.00 Amazon gift certificate. Everyone is eligible to win if you leave a comment regarding this post and anything you might know about Churchill by Friday night before midnight Pacific time. I'll announce the winner on Saturday, August 1st. Labels: 1st Baron Moran, Churchill, Mental Health, Nobel Prize in Literature, The Black Dog, The Churchill Centre. I have to admit that I really know nothing about Sir Churchill. I love how your curiosity has been piqued. Not knowing much about Churchill is what drove me to find out more. I love Churchill and have always admired his overcoming spirit. Your post is thoughtful and intriguing. Thanks Rebecca. He really "never gave up," from what I can find. What an interesting post. I didn't know that much about Churchll. Thank you! There's so many things that distract us from history today. Just leading busy lives that we are either unaware or just have gone so far away from the past that we don't hear much today about people like Churchill. How interesting! I really enjoyed your post, Jillian, and appreciate the links you included. My knowledge of Churchill is limited, and I look forward to learning more. Enjoy following the links. Lot's of interesting stuff if you're a history buff. How fascinating! Now I have many more questions about Churchill! Are there any historical fiction books about him? May have to study him more closely with my kids. Thanks! I'm sure if you go to Google, Amazon, or Barnes and Noble you'll find something. I love librarians and I bet they could point you in the right direction. Maybe someone reading this post can make a recommendation. "He wrote newspaper accounts of his escapades." Love it! Thanks Deanna. Interesting...I did not know there was a history of depression. I believe his mother was an American heiress and so were her sisters. The more I read about his mother the more fascinating this story becomes. I didn't think he had any sisters. Really interesting post, Jillian. I know Churchill was a great man but I've never read much about him before now. There were so many aspects about him that I didn't know either and still have much to learn. Don't know that much about Churchill. Thanks for pointing out that he dealt with depression. Most dealt with whatever mental illness during that time and was covered up. Something society didn't not want to hear about. I have followed some of Churchill's history but don't recall hearing this before. Thank you for the informative post! Thank you for an interesting post, Jillian. In addition to Sir Winston's many talents, he was an accomplished artist and would retreat to his country home Chartwell and his easel and paints when struggling with the black dog. I visited his war offices under the streets of London and saw amd heard of the self sacrifices he made while directing the course of the war. The strain of his position and the personal hardships he faces must have had an impact on his mental health as well. Thank you for the opportunity to comment. I have no idea how that man painted so much. I looked up this link and was surprised to see page after page. That's wonderful that you got to see his war offices. I think you're right about the strain of his position contributing to his mental health issues and then of course there's the family history which didn't help. Now I'll have to go look for more on the underground offices and more on art as well. Thanks so much for your comment. Very interesting, I don't know much about Churchill, but did read not long ago that the mother of this famous Brit was actually an American! I didn't know that! I went looking and found this picture. She was something else from the sounds of it. I can see while I was at the day job there's been some interesting discoveries about Churchill. Thank you all for your comments and findings. I'll be commenting further on some of your posts too. How'd you grow up knowing so much about him? From school or a family member, etc.? I had no idea he had such a personal experience with mental illness. I associated him with the war and his famous quote, but don't know anything beyond that. Thanks for sharing this fascinating glimpse into history! Glad you liked it, Heidi. I was unfamiliar with the Black Dog and didn't realize that Sir Winston dealt with depression. I only knew of his tremendous efforts during World War II and I visualize him sitting with President Roosevelt. The library where I worked 22 1/2 years has his 4 volume biography. Wow! Four volume biography. That says a lot, doesn't it? Thanks for all the comments this week. It's been a pleasure connecting with you. It's time to announce the winner of the $15.00 Amazon Gift Certificate and according to random.org the winner is Pat Jeanne Davis. Congratulations, Pat. I'll be in touch.